Microsoft is planning to launch a number of Windows Mixed Reality headsets next month, and it appears Samsung is planning its own in the near future. Twitter user WalkingCat has uncovered photos of Samsung’s Windows Mixed Reality headset, and it appears to include six degree-of-freedom tracking like most of Microsoft’s headsets. 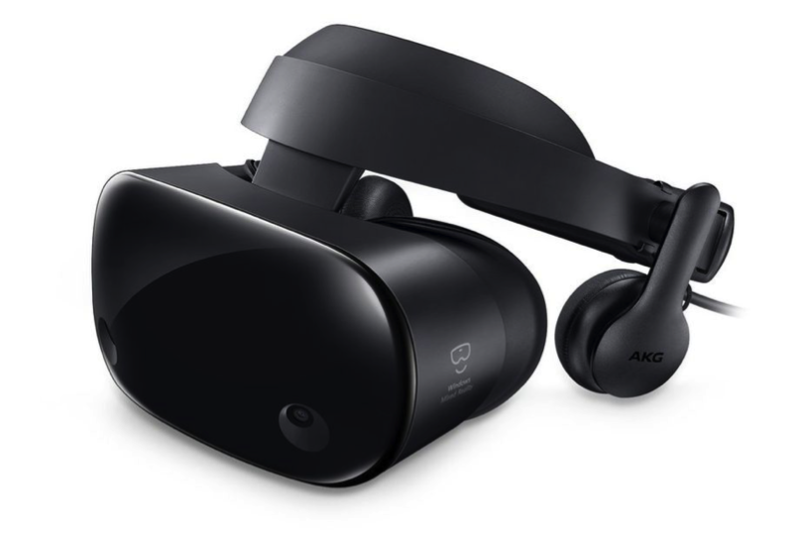 Little else is known about the Samsung headset, but the pictures do show off built-in headphones from AKG that look very similar to what’s included on Oculus’ Rift VR headset. It appears Samsung will be shipping its Mixed Reality headset with Microsoft’s motion controllers. Microsoft is planning to hold a special Mixed Reality event next week, and it’s possible that the Samsung headset could be part of any announcements. Mixed Reality headsets will start launching next month alongside Microsoft’s Windows 10 Fall Creators Update on October 17th. The first headsets include pricing at $299 from Acer, HP pricing its own at $450 (with motion controllers) and Dell / Lenovo pricing theirs at $349. Asus won’t be releasing its Windows Mixed Reality headset until Spring 2018, despite already showing off its unique polygon design. Samsung may choose to unveil its headset and also ship it later.